PC gaming is the most affordable it’s ever been—and for a lot of people it’s also the best value, for a multitude of reasons. The announcement of Sony’s PlayStation 4 Pro just drove that point home. PC gaming is still more expensive, at least up front. That hasn’t changed. If you can build a desktop for $400, you’re either a wizard or extremely good at snagging discount parts and waiting for sales. More power to you. But the PC isn’t that much more expensive at this point. Head to PC Part Picker or Reddit’s /r/buildapc and you’ll find plenty of entry-level builds in the $550 range and some jaw-dropping high-end builds in the $800-900 range. Prices have come down a lot—video card prices especially. AMD’s Polaris GPUs are an especially great bargain for those looking to game on the cheap. A Radeon RX 480 will only run you $200, which is incredible. You can take a look at my colleague Brad Chacos’s in-depth review for explicit benchmarks, but the gist? Max out graphics at 1080p resolution and you’ll still hit 60-plus frames per second in basically every modern game. For only $200. Now, finding an RX 480 at its recommended list price is hard as hell, but the point is that companies want PC gaming to be accessible. They want enthusiasts buying GPUs. Competition has made the PC more affordable than ever before. Hell, you can go lower than that if you’re only looking to match the performance of the original PS4 and Xbox One. A $110 graphics card like the GeForce GTX 950 or Radeon RX 460 paired with AMD’s affordable FX-6350 ($118 on Amazon) will get you over that extremely low bar. A lot of people are going to be frustrated come November. A few years ago they bought a PlayStation 4—at the time the most powerful console ever made. And they expected it to last them for years. Years. We can talk all we want about expectations around consoles, about why people are willing to spend $600+ on a phone every two years but expect a $400 console to last them for ten. But I’m not talking about that here. I don’t really care—this is PCWorld, after all. Besides, it’s a tangential argument. The difference, this time, is that consoles are now using a faux-PC upgrade strategy. If Wednesday’s PlayStation event is any indication, we can now expect consoles to transfer into “platforms”—tiers of hardware, with more powerful boxes released every three to four years. It’s not just Sony doing this. Microsoft has its own Project Scorpio upgrade planned for the Xbox One in Q4 2017. Tonight I could pop open Steam and play Street Fighter V. I could also play Dead Rising 3, Rise of the Tomb Raider, Axiom Verge, Talos Principle, Killing Floor 2, Darkest Dungeon, No Man’s Sky, Downwell, SOMA, Everybody’s Gone to the Rapture, Transistor, Grow Home, Hotline Miami 2, N++, Volume, and so many others. The video below is of Tekken 7 running at 4K resolution on a PC. Microsoft’s gone further and wholesale embraced its involvement in both the Xbox and Windows 10, creating the Xbox Play Anywhere program. Nearly every “Xbox Exclusive” is coming to Windows 10 day-and-date nowadays, including Gears of War 4, ReCore, Quantum Break, Forza Horizon 3, and more. The only Xbox series we haven’t heard plans for yet is Halo. 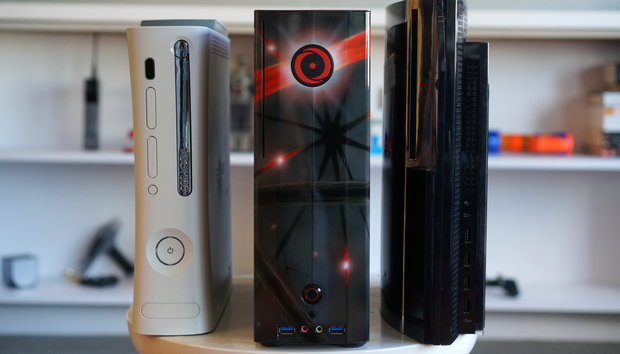 Point being: Buying a PC rarely means missing out on console games these days. Sure, you won’t be able to play handful of first-party titles on Sony’s end, but everything else makes it over—and often (barring edge cases like Arkham Knight) in better condition than the console versions. The entire strategy genre, for one. With the exception of Halo Wars and a handful of less-successful others, both turn-based and real-time strategy games are mostly found on the PC—and there are a ton. It’s not all plodding strategy games though. There are hundreds of games each year that make a name for themselves on PCs and never make it onto consoles. These span genres, from shooters (Unreal Tournament, Quake Champions) to RPGs (Tyranny, Mount & Blade II) to...I don’t even know (Duskers, Factorio). It’s not unusual to see pre-orders for big games go for 10 or even 20 percent off on Steam, and by six months post-release many big games will fall to $15-20 during a sale. Or lower. Great indie games often go for under $10 or even $5 on sale if you’re patient. Consoles? Even on sale, most games seem to bottom out around $30 for years on end. And don't get me started about the idea of paying for online multiplayer. Ugh. Still none of that here. The PC is in a good spot—probably the best it’s ever been, and getting better all the time. If you watched Sony’s PlayStation 4 Pro announcement with disappointment, or bemusement, maybe it’s time to think about moving to a more open platform.